If any show is going to get away with doing an up-and-back, it's Doctor Who. After all, the series' title character is capable of moving within time and space itself. It's only natural, then, that many of his adventures come with a sense of significant change in the lives of the Doctor and, say, his companion, only to be set right by the end of an episode or, in the case of 'The Magician's Apprentice,' after a season finale. It even allows for some leeway when the Doctor's oddly captivating nemesis, seemingly vaporized by a Cyberman that was part of her ill-fated plan to answer the question of whether or not the Doctor was "a good man," is resurrected with nothing more than a quip by evil Time Lord in question to address her return. We get it; it's Doctor Who – stuff like this just happens. But there's a danger to running one up-and-back to kick off a season, while at the same time beginning another, more extreme up-and-back to drive the premiere episode into a cliffhanger. It's even more perilous when the stakes of said cliffhanger are intended to, once again, answer the question of whether or not this current iteration of the Doctor is in fact "a good man." At a certain point, everything that occurs within the narrative of Doctor Who (or any show, really) comes up against the notion of structure. Audiences watch a lot of TV, so, whether they are consciously aware of it or not, they're well attuned to gauge how important an event is simply by the way in which it was presented. Case in point: at the end of season 8, 'Death in Heaven' presented Peter Capaldi's Doctor with the task of lying to Jenna Coleman's Clara and vice versa, as they both assured one another there was a purpose in their lives potentially greater than continuing on as the Doctor and his companion. With Missy (Michelle Gomez) having been dispatched earlier, the episode utilized the structure of a season finale to present the audience a sense that things might really be different when season 9 rolled around. It was effective because the audience has learned to read certain cues – the end of a season being one – and from them, to intuitively understand what the stakes are. At the end of a season, the audience can expect the nemesis will be vanquished. At the end of a season, the audience can expect the status quo will be shaken, if not altered entirely. This gives the following season the chance to begin anew, to construct a similar – but still fresh – status quo from which new stories can be produced. What's interesting about 'The Magician's Apprentice,' then, is how quickly it pulls an up-and-back on 'Death in Heaven' and then proceeds to do the same once the episode's A-plot reaches a crescendo. It is only after a series of intriguing false starts that the episode's story really gets going. There are some admittedly alluring prospects, like the Doctor coming face-to-face with a young Davros before he'd created the Daleks, and the intergalactic journey by Colony Sarff (the guy whose face looks like the Michelin Man, but then turns out to be a gigantic coiled snake) to find the Doctor on behalf of an aged and dying Davros. 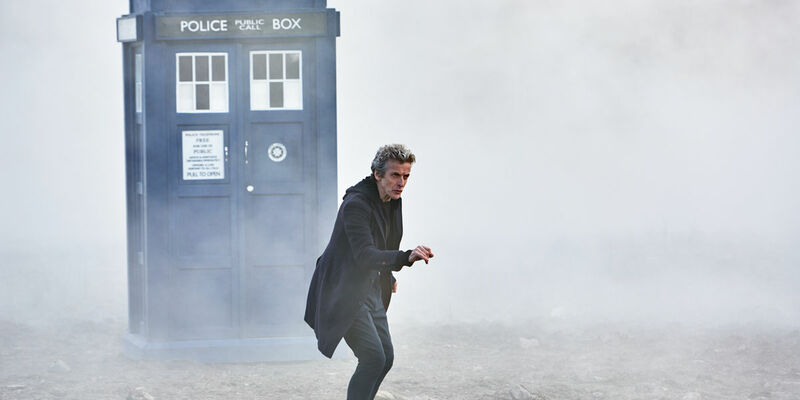 Questions arise simply by virtue of the episode staging two ends and leaving the audience to figure out where they meet – which is somewhere at the intersection of "What Did the Doctor Do?" and "How Does He Plan to Undo It?" Before there can be too much exploration into the A-plot, the episode veers off into a B-plot, involving Clara's investigation into thousands of planes that have been frozen in the sky, which turns out to be the handiwork of the aforementioned Missy. As welcome as it is to have Michelle Gomez back – bringing with her yet another mystery in the form of the Doctor's confession dial, which, by name alone suggests even more drudgery into the facile question of "Am I a good man?" – the glib manner in which her return is addressed is almost too insincere, even for a character as symptomatically disingenuous as the Master. It crosses a boundary that goes beyond the freedom Doctor Who enjoys when it comes to logic. By that, it seeks to address the audience directly, going the route of telling when showing would have sufficed – all of which would be fine if the statement weren't tantamount to the audience being told to just "shut up and watch the show already." At a certain point, though, you can understand the slick manner in which Missy discussed her return. 'The Magician's Apprentice' is little more than an hour of questions with no answers, so ostensibly vetoing a character-based question in favor of making room for more plot-based questions makes sense. It also doesn't hurt that, once the Doctor, Clara, and Missy are whisked away to meet with Davros on what is revealed to be a recreated Skaro, Missy winds up being vaporized all over again, along with Clara and the Tardis. The problem is, the premiere is so concerned with establishing a particular kind of situation with a particular set of stakes it effectively nullifies the stakes associated with life and death (and Tardis destruction) in the process. It's a weighty gamble, as Doctor Who essentially wagers the significance of the Doctor's goodness – that is, the question of whether or not he will travel back in time to murder a child who will grow up to be a genocidal maniac – against the significance of Clara Oswald's continued existence. The trick, then, is that the audience already knows the outcome of one of these scenarios, making Clara and Missy's deaths either a clever way of underlining the Doctor's eventual moral quandary or a shallow attempt at generating significance with events that will be undone. In a sense, though, despite being the antithesis of actual life-and-death stakes, the scenario works to establish what is actually being weighed against what. In this case, it's the weight of one life against billions of lives. And while it's not a unique position for a character to be placed in – especially one who routinely dabbles in time travel – there is still a chance that Doctor Who will find significance in pursuing the answer. It's just too bad it took an entire hour for the show to pose the question. As far as season premieres go, 'The Magician's Apprentice' went big on setup in order to presumably go even bigger on the following episode's payoff. That meant an exciting, if uneven start to season 9. One that may end up relying too heavily on the season's second episode when it comes to establishing its relevance.